Transport in North Korea is constrained by economic problems and government restrictions. Public transport predominates, and most of it is electrified. Travel to North Korea is tightly controlled. The standard route to and from North Korea is by plane or train via Beijing. Transport directly to and from South Korea was possible on a limited scale from 2003 until 2008, when a road was opened (bus tours, no private cars). Freedom of movement in North Korea is also limited, as citizens are not allowed to move around freely inside their country. On October 14, 2018, North and South Korea agreed to restore inter-Korean rail and road transportation. On November 22, 2018, North and South Korea reopened a road on the Korean border which had been closed since 2004. On November 30, 2018, inter-Korean rail transportation resumed when a South Korean train crossed into North Korea for the first time since November 2008. On December 8, 2018, a South Korean bus crossed into North Korea. Fuel constraints and the near absence of private automobiles have relegated road transportation to a secondary role. The road network was estimated to be around 31,200 kilometres (19,400 mi) in 1999, up from between 23,000 kilometres (14,000 mi) and 30,000 kilometres (19,000 mi) in 1990, of which only 1,717 kilometres (1,067 mi), 7.5%, are paved. However, The World Factbook (published by the US Central Intelligence Agency) lists 25,554 kilometres (15,879 mi) of roads with only 724 kilometres (450 mi) paved as of 2006. As for the road quality, drivers will often swerve and change lanes to evade potholes, and this includes going into opposite-direction lanes at times. Likewise, sections under repair may not be properly signalled, so oncoming traffic should always be expected even on a divided motorway. There are three major multilane highways: a 200-kilometre (120 mi) expressway connecting Pyongyang and Wonsan on the east coast, a 43-kilometre (27 mi) expressway connecting Pyongyang and its port, Nampo, and a four-lane 100-kilometre (62 mi) motorway linking Pyongyang and Kaesong. The overwhelming majority of the estimated 264,000 vehicles in use in 1990 were for the military. Rural bus service connects all villages, and cities have bus and tram services. Since 1945/1946, there is right-hand traffic on roads. In cities, driving speeds are set by which lane a driver is in. The speed limits are 40 kilometres per hour (25 mph), 60 kilometres per hour (37 mph), and 70 kilometres per hour (43 mph) for the first, second, and subsequent (if existing) lanes from the right, respectively. A white-on-blue sign informs about this. The leftmost lane, if it is number 3 from the right or higher and is not a turning lane, is often left vacant, even by tourist buses, while the second-from-right lane is generally used to overtake vehicles from lane one, such as public transport buses and trams. Besides the blue in-city sign, all other occasions, such as motorways and roads outside cities, use the more widely known red-circle-with-number-inside sign to post speed limits. On motorways, the typical limit is 80 kilometres per hour (50 mph) and 100 kilometres per hour (62 mph) for lanes from the right, respectively, as posted on the Pyongyang-Kaesong highway, for example. The rightmost lane of a motorway is sometimes, as seen on the Pyongyang–Myohyang highway, limited to 60 kilometres per hour (37 mph) near on-ramp joining points. Automobile transportation is further restricted by a series of regulations. According to North Korean exile Kim Ji-ho, unless a driver receives a special permit it is forbidden to drive alone (the driver must carry passengers). Other permits are a military mobilization permit (to transport soldiers in times of war), a certificate of driver training (to be renewed every year), a fuel validity document (a certificate confirming that the fuel was purchased from an authorized source), and a mechanical certificate (to prove that the car is in working order). 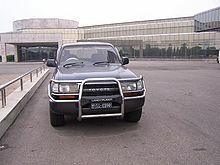 Although it drives on the right, North Korea has imported various used right-hand drive RHD vehicles from Japan (through Russia), from tourist buses to Toyota Land Cruisers and HiAces. As of 2017, electric bicycles are becoming popular in Pyongyang; about 5% of bicycles are electric. Both locally and Chinese electric bicycles were available. As of 2016 there is 26,176 kilometres (16,265 mi) of road which is 25% of South Korea's road system in length. Roadworks in North Korea. The blue truck in the foreground is a Chinese-made Dongfeng. There is a mix of locally built and imported trolleybuses and trams in the major urban centres of North Korea. Earlier fleets were obtained from Europe and China. A Proton Wira yellow taxi in Pyongyang. The Korean State Railway is the only rail operator in North Korea. It has a network of over 6,000 kilometres (3,700 mi) of standard gauge and 400 kilometres (250 mi) of narrow gauge (762 mm or 30.0 in) lines; as of 2007, over 5,400 kilometres (3,400 mi) of the standard gauge (well over 80%), along with 295.5 kilometres (183.6 mi) of the narrow gauge lines are electrified. 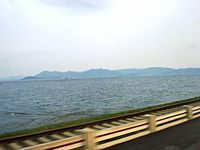 The narrow gauge segment runs in the Haeju peninsula. Because of lack of maintenance on the rail infrastructure and vehicles, the travel time by rail is increasing. It has been reported that the 190-kilometre (120 mi) trip from Pyongyang to Kaesong can take up to six hours. Water transport on the major rivers and along the coasts plays a growing role in freight and passenger traffic. Except for the Yalu and Taedong rivers, most of the inland waterways, totaling 2,250 kilometres (1,400 mi), are navigable only by small boats. Coastal traffic is heaviest on the eastern seaboard, whose deeper waters can accommodate larger vessels. The major ports are Nampho on the west coast and Rajin, Chongjin, Wonsan, and Hamhung on the east coast. The country's harbor loading capacity in the 1990s was estimated at almost 35 million tons a year. There is a continuing investment in upgrading and expanding port facilities, developing transportation—particularly on the Taedong River—and increasing the share of international cargo by domestic vessels. In the early 1990s, North Korea possessed an oceangoing merchant fleet, largely domestically produced, of 68 ships (of at least 1,000 gross-registered tons), totalling 465,801 gross-registered tons (709,442 tonnes deadweight (DWT)), which included 58 cargo ships and two tankers. As of 2008, this has increased to a total of 167 vessels consisting mainly of cargo and tanker ships. North Korea maintains the Man Gyong Bong 92, a ferry connecting Rajin and Vladivostok, Russia. North Korea's international air connections are limited in frequency and numbers. As of 2011, scheduled flights operate only from Pyongyang's Pyongyang Sunan International Airport to Beijing, Dalian, Shenyang, Shanghai, Bangkok, Kuala Lumpur, Singapore, Moscow, Khabarovsk, Vladivostok, and Kuwait International Airport. Charters to other destinations operate as per demand. Prior to 1995 many routes to Eastern Europe were operated including services to Sofia, Belgrade, Prague, and Budapest, along with others. Air Koryo is the country's national airline. As of 2017[update], Air China also operates flights between Beijing and Pyongyang. In 2013, MIAT Mongolian Airlines began operating direct charter services from Ulaanbattar to Pyongyang with Boeing 737-800 aircraft. Internal flights are available between Pyongyang, Hamhung, Haeju (HAE), Hungnam (HGM), Kaesong (KSN), Kanggye, Kilju, Najin (NJN), Nampo (NAM), Sinuiju (SII), Samjiyon, Wonsan (WON), Songjin (SON), and Chongjin (CHO). All civil aircraft are operated by Air Koryo, which has a fleet of 19 passenger and cargo aircraft, all of which are Soviet or more modern Russian types. As of 2013, the CIA estimates that North Korea has 82 usable airports, 39 of which have permanent-surface runways. It was reported that North Korean air traffic controllers had been cut off from the international global satellite communications network in 2017 because North Korea had not made the required payments. Traffic controllers at Pyongyang Sunan International Airport had to use conventional telephone lines to inform their counterparts at Incheon International airport that the flight by a North Korean delegates to the 2018 Winter Olympic Games in South Korea had taken off. A trolleybus in Pyongyang with three distance stars, indicating it has gone over at least 150,000 kilometres (93,000 mi) safely. Road vehicles in North Korea bear distance stars. These are paint markings which display how far the particular vehicle has traveled without incident. Each star represents 50,000 kilometres (31,000 mi) travelled without an accident. The bus in this example has three stars, indicating that it has traveled over 150,000 kilometres (93,000 mi) without a crash. ^ a b c d e This article incorporates public domain material from the Library of Congress Country Studies document "North Korea: A Country Study" by Savada, Andreas Matles, ed. (1994). Retrieved on 27 July 2013. Fourth ed. Washington: Federal Research Division of the Library of Congress. ISBN 0-8444-0794-1. ^ "North Korea: Transportation". CIA World Factbook. Archived from the original on July 3, 2015. Retrieved July 13, 2013. ^ a b "Driving in North Korea and Speed Limit Regulations". New Focus International. Feb 24, 2013. Archived from the original on July 17, 2013. Retrieved July 13, 2013. ^ a b "North Korean traffic police moonlight as service stations". New Focus International. July 12, 2013. Archived from the original on July 15, 2013. Retrieved July 13, 2013. ^ Frank, Ruediger (6 April 2017). "Consumerism in North Korea: The Kwangbok Area Shopping Center". 38 North. U.S.-Korea Institute, Johns Hopkins University School of Advanced International Studies. Archived from the original on 11 April 2017. Retrieved 10 April 2017. ^ "North Korea's Economy Remains Tiny, But Has Some Bright Spots". 15 December 2017 – via www.bloomberg.com. ^ Rob Dickinson. "A Glimpse of North Korea's Railways". The International Steam Pages. Archived from the original on 2 May 2008. Retrieved 4 July 2009. ^ Paul French (2007). North Korea: The Paranoid Peninsula – A Modern History. 2nd ed. New York: Zed Books, p. 18, ISBN 1842779052. ^ Shim, Elizabeth (May 18, 2017). "North Korea ferry service launched between Rajin, Vladivostok". UPI. The Man Gyong Bong 92 left the North Korean port of Rajin on Wednesday evening with about 40 passengers on a trial run. It arrived in Vladivostok on Thursday at 8 a.m., Russia's state-run Tass news agency reported. ^ Ryall, Julian (2018-02-23). "From paper to fuel, North Koreans endure widespread shortages as sanctions take their toll". The Telegraph. ISSN 0307-1235. Retrieved 2018-02-23. ^ Lankov, Andrei. "Pyongyang and its people (notes of a Soviet student)". North Korean Studies. Retrieved 15 February 2019. Download a map of the entire North Korean Railway system to Google Earth here. DUCRUET, Cesar, JO, Jin-Cheol, LEE, Sung-Woo, ROUSSIN, Stanislas, 2008, Geopolitics of shipping networks: the case of North Korea's maritime connections, Sustainability in International Shipping, Port and Logistics Industries and the China Factor, International Association of Maritime Economists (IAME), Dalian, China, April 2–4. DUCRUET, Cesar, ROUSSIN, Stanislas, 2007, The changing relations between hinterland and foreland at North Korean ports (1985–2006), 6th Inha & Le Havre International Conference, Inha University, Incheon, Republic of Korea, October 10–11. DUCRUET, Cesar, ROUSSIN, Stanislas, 2007, Inter-Korean maritime linkages: economic integration vs. hub dependence, 15th European Conference on Theoretical and Quantitative Geography, Montreux, Switzerland, September 7–11, pp. 133–139 ISBN 978-2-940368-05-1. ROUSSIN, Stanislas, DUCRUET, Cesar, 2007, The Nampo-Pyongyang corridor: a strategic area for European investment in DPRK, Recent Changes in North Korea and the Role of the European Union, Institute of Unification Studies & Hans Seidel Foundation, Seoul National University, Seoul, Republic of Korea, June 1. ROUSSIN, Stanislas, DUCRUET, Cesar, 2007, Doing business in DPRK for the European companies: the logistic issue, Seogang University, Seoul, Republic of Korea, May 26. ROUSSIN, Stanislas, DUCRUET, Cesar, 2006, Logistic perspectives in DPRK, Annual Fall Meeting of the Korean Society of Coastal and Ocean Engineers, Seoul, Republic of Korea, September 15–16. Ducruet, Cesar et Roussin, Stanislas (2007) Coree du Nord : vers l'ouverture des ports maritimes, Journal de la Marine Marchande, No. 4566, Juin 22, pp. 6–9. Wikimedia Commons has media related to Transport in North Korea. This page was last edited on 15 February 2019, at 09:17 (UTC).